Office park developer Hamilton Partners has always focused on bringing amenities to its sites. Daycare, fitness centers, and dining options are all located nearby, yet within the last five years, the addition of transit connections has been critical to staying competitive. Leasing agents have found that while real estate costs are lower outside the urban core, if people are not willing or able to travel to a suburban office location, transportation becomes a priority issue. 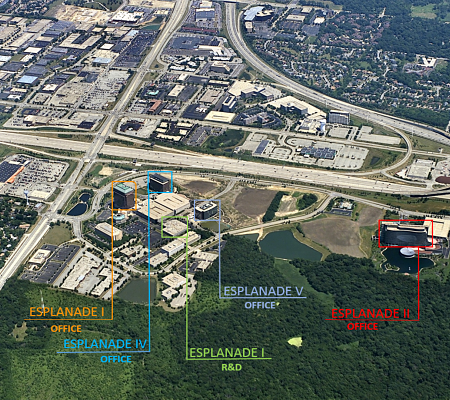 Established in Downers Grove 28 years ago, Hamilton Partners owns and operates an 80-acre and three million square-foot office park known as Esplanade. Located near the critical highway junction of East-West Tollway (I-88), and the North-South Tollway (I-355), it is not particularly close to transit. Travel via Metra from Chicago to Downers Grove takes approximately a half an hour, and prior to 2016 riders then had to take two Pace buses to reach the north end of the park, adding up to 40 minutes in last-mile travel time. The lack of a quick, easy transit connection to the train was affecting recruitment and retention of talent, and tenants were rethinking their locations at the office park. Ultimately, one of the major tenants, which had a managing partner making a reverse commute, demanded a last-mile solution. To begin to address the last-mile problem, Hamilton Partners surveyed their 4,000 tenants. The results helped them formulate the goal to create a low- or no-cost last mile amenity that would compete with free parking. Hamilton Partners worked with Pace Suburban Bus to develop dedicated rush hour bus service. 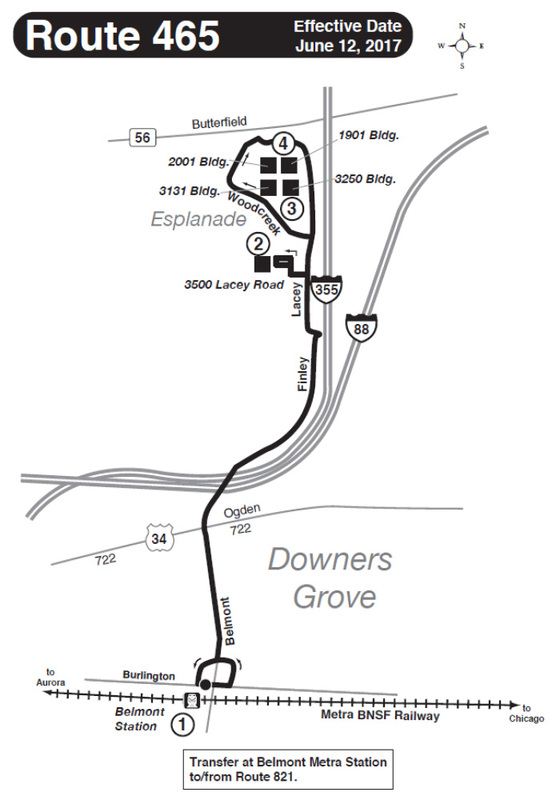 Once a dedicated bus route was in place, the Downers Grove Belmont station became accessible via a direct 4-mile bus ride. After a test period, there were not enough riders for Pace to continue the service at full public cost, but Hamilton decided to subsidize 30 percent of operating costs to ensure its continuation as an amenity. Hamilton tenants are provided a special pass for free bus fare. The Pace bus is also publicly accessible to any other businesses in that development with a Ventra card. People who are interviewing for job can use transit to get there as the public Pace route shows up in transit planning apps (in contrast to private corporate shuttles). At a second location in Itasca, Hamilton Partners took a different approach to the last-mile issue by partnering with Innova EV, a local electric car-share company. While the distance from the Hamilton Lakes office park to the Metra Itasca stop is just under 1.5 miles, the Pace bus connections are often not timed for a reliable connection if the Metra train arrives a few minutes late, and there is still a significant walk to the office entrance from the bus stop. With the Innova service, operated as Dash, up to three small electric vehicles and a Nissan Leaf four-seater with drivers are waiting at the curb when the train arrives. Riders make a reservation using a smartphone app to ensure a vehicle is waiting for them, or can walk up and instantly reserve a ride. The cost per ride is $3, and riders can purchase monthly unlimited ride cards for $96, or 23- or 12-ride cards for $60 or $30. This is a more affordable solution for regular users than Lyft or Uber, which generally runs more than twice the cost per ride. Choose DuPage, the county’s economic development agency, has been supporting advertising of the service since operation began in early 2017. When Hamilton Partners shows prospective Downers Grove tenants space, the free bus service is a major differentiator. Now the company looks at improving transit solutions for all its suburban office parks. “Companies moving downtown has been a major wake-up call to suburban property owners. Talent is the first concern for businesses, and real estate is second,” notes Principal Phil Sheridan. While ten years ago this was not an issue, now it is a regular topic of conversation with prospective tenants. “For tech companies, transit access is one of the top three questions,” says Sheridan. The Esplanade location is served by Metra BNSF Line to Downers Grove and Pace Route 465 bus service. The Itasca Hamilton Lakes location is served by Metra Milwaukee District West service with connections via Pace buses or Dash shared ride service. The Pace Route 616 also operates express on I-90 between Itasca and the Rosemont Transit Center.